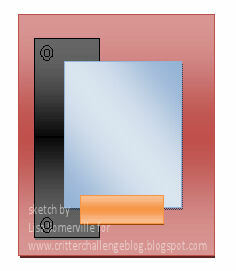 It's time for another Critter Sketch Challenge - and this week I'm the sketch hostess! It's normally not my week to play, but having missed last week, and being the Sketch Hostess, I thought I join in! This month's sponsor at the Critter Blog is LimeLight Paper Crafts. 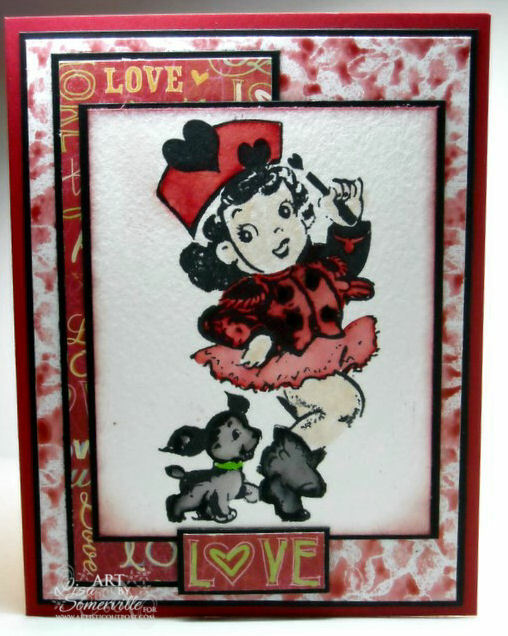 I used images from the Artistic Outpost Cutie Pie plate to create my card, stamping the image in Black Archival on Watercolor paper, then coloring using the Marker Watercoloring Technique. 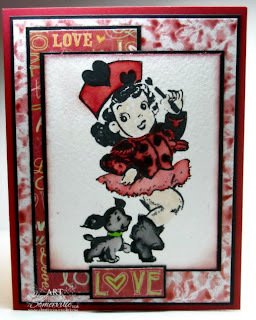 The Background was created using the Glimmer Lace Technique from the current Technique Junkie Newsletter. Looking for more inspiration using this weeks sketch, head over to the Critter Blog to see what the other Designers created this week, and find out how you can play along. I luv a parade and this card says it all, luv it! What a fun card! I am so glad that you showed off that technique from the Newsletter! It looks fabulous on your card! Your coloring looks so wonderful. I keep practicing that watercolor technique...I guess I need more practice, practice, practice! You are the pro! Love this vintage gal!! The red and black colors you used showcase her to perfection Lisa! Thanks for the creating such a fun sketch for this weeks Critter challenge! Love the lace background! Your coloring is always perfect and this little marching darling is proof! Love it! Great job on the sketch, she is so cute and the colors are some of my favorite combos! Love the sketch~ hope I can find time to play along! Love the vintage look and your coloring technique looks great! Thanks for a wonderful sketch to play with this week! Love your background which works perfectly for the sweet image! Great sketch and Cute card. So pretty, love your sketch. Great card Lisa. Love what you did with the sketch! Wonderful coloring of your image ... and gorgeous background too. Thank you so much for putting together such a wonderful sketch this week. Esp since it's your off week, great card. So cute! !